One of the many advantages of renting a holiday apartment is having your own kitchen. Even if you aren’t planning on cooking any full-course meals (after all, you are on holiday!) it’s great being able to prepare snacks, keep drinks cold, and not have to eat every meal out. Which is not only more economical but adds to that special “home away from home” feeling. Although at first sight the rather magnificent, if a little run down, Arenal Market building on Calle Pastor y Landero looks older, it was only built in 1937 on the site of a former prison. 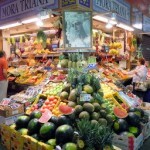 Like all the principal municipal markets it is an excellent place to do a bit of shopping, especially for fresh fruit and veg, fish and meat. Untypically, there is also a small supermarket inside, as well as a very popular (and rather pricey) seafood restaurant, and a vegan delicatessan. 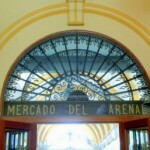 The Encarnación Market has a long history, dating back to its original founding on the site of the demolished Encarnación convent in Napoleonic times. 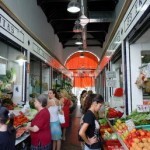 The current market (now back on the site of the original after some 37 years in a “temporary” building in the corner of the square) is in a modern, purpose-built hall on the ground floor of the Espacio Metropol Parasol. It’s clean, light and airy, with well-equipped stalls, and a fabulous selection of fresh fruit and veg, fish, seafood and meat. After a post-shop beer and tapa at one of the bars in the market, have a look at the Roman ruins and take the lift to the top of “the mushrooms” to enjoy the spectacular views. 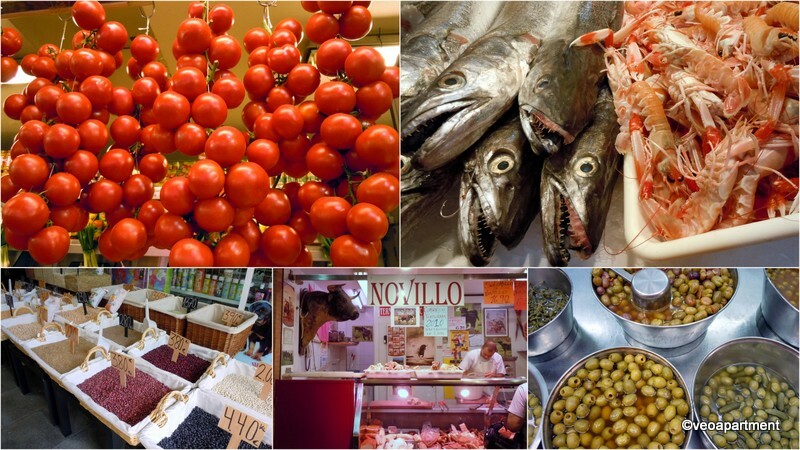 Feria Market, about halfway along the street of the same name next to the 13th century Omnium Sanctorum Church, is the oldest of the four central municipal markets, and also the smallest, making it a cosy and friendly place for all your fresh food shopping. The market is divided between two buildings with a narrow street in between, and there are other small shops around the outside. The market’s café-tapas bar, La Cantina, is a bit special, both for its ambiance and the quality and freshness of the food. You can find Triana Market at the western end of the Isabela II (Triana) bridge. 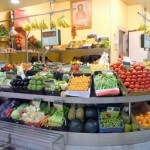 It´s about 150 years old, and was very substantially renovated in 2005, but the retention of traditional features like the ceramic nameplates for the stalls makes it a pleasing combination of modern facilities and the picturesque.You can find a full range of top-quality fresh produce, fruit and veg, fish, seafood and meat at reasonable prices. Enjoy a beer and a tapa at the bar or, if you’re feeling flush, try some oysters and champagne at Seville’s only oyster and champagne bar, both located inside the market. You can also visit the Museum of Tolerance in the ruins of San Jorge Castle, once the headquarters of the Inquisition.